Good news are the highlight of our latest newsletter. Ganter has received the prestigious iF Design Award again. Moreover we want to inform you about recent diversifications and our noteworthy trade fairs in April. The cabinet "U" handles GN 422 won over the international jury, made up of independent experts from all over the world. The product presents a functional and highly compact unit that can be used for a variety of application due to its universal design. Developing handles with an electical switching function allows complex functions to be miniaturized and yields a solution for safety-critical applications. You can find out additional information here. An extension of our square tube clamp product line, Ganter now offers locking slide units GN 134. 7 and GN 147. 7. Recurring positions along a square construction tube can be moved easily and quickly with the incorporated positioning components. The required positioning holes and countersinks on the square tube can be created by the user according to their design instructions or ordered as completely finished construction tubes with the various positioning holes GN 990. 1. You can request your free ticket directly via e-mail at info@ganter-griff.de..
Fast and direct! 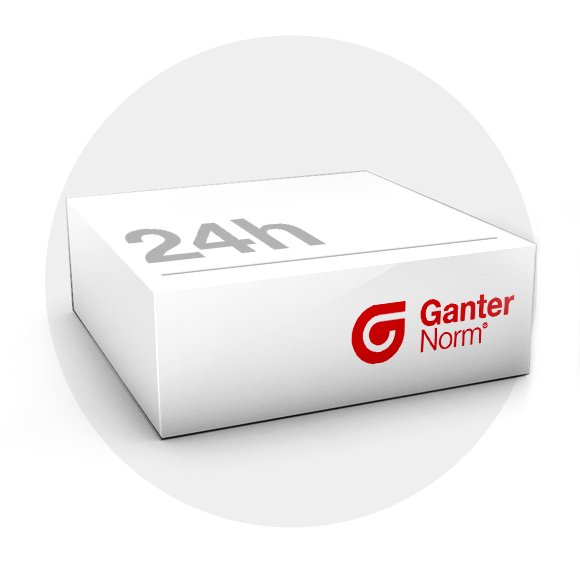 Thanks to a streamlined logistics concept, Ganter is capable of delivering standard parts at extremely short notice – anywhere in the world.